September 2012 – Oh Remy! 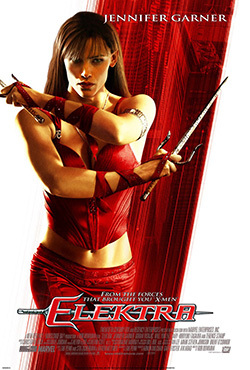 Elektra’s character came known to the world from Daredevil comics, where she was portrayed as the true love of Daredevil – unfortunately for both of them, turned bad. She was an expert ninja assassin working for the Hand and for crime lords like Kingpin. In the comics the character was full of pain and could-have-should-haves and finally she died – only to come back to life in the famous story “Elektra Lives Again” (fin. “Elektra elää”). And finally she became so popular a character she got many comics of her own, none of which have been published in Finland, I think. I could be wrong since it’s been aeons since I read those stories. But nevertheless, I always liked Elektra for her skill and strength but also for her tragedy. Against that background it’s a real shame the movie makers have wasted the character on such a mundane story as this movie. You could have shown Elektra as the badass assassin, doing jobs here and there and finally meeting Daredevil and having to face her choices and start the changing process. Or show her death as the best assassin there is, only to be betrayed by her bosses just when she begins to change herself away from the world of crime. You know, anything you want with lots of tragedy and you could do it well without Daredevil. Indeed. The movie is just a wasted opportunity. They had Elektra, and they had her being played by the very popular at the time Jennifer Garner from the hit show of the time, Alias. Ok, they already had the Daredevil (2003) movie with Ben Affleck, which was such a painful movie to watch I’m happy I have forgotten most of it already. Let’s be frank, this movie was done after the X-Men (2000) and X-Men 2 (2003) which changed how superhero movies were made and finally gave the movie industry some backbone to actually try make good superhero movies and put some money and heart into them. And one would think that after making Daredevil, which no-one can honesty call a good movie, they would gave learned at the 20th Centry Fox that you actually have to make good superhero movies for people to like them. Then again, the worst part is, no matter how much money they would have poured into this one they could not have saved the movie from its script. It’s just that bad. The movie begins with an assassination job where Elektra kills off more people than just her target. I suppose this is to make us believe here is the badass assassin who values life close to a zero. But in private she’s ready to call it quits when she gets one more gig too good to pass. She’s not given her target yet but is asked to spend a few days in a large building where she rans into her neighbours. A young girl breaks into her apartment and tries to steal stuff from her which is a nice excuse to get to know the handsome father, who’s young enough to be the girl’s older brother rather than father. For some reason which I don’t really understand the fact that the girl is a thief and a skilled one at that, Elektra lets the crime slip. The father doesn’t really seem to care enough as to punish the daughter or even to display any apologetic behavior towards Elektra. 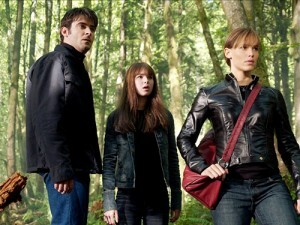 Inexplicably, Elektra starts to like the family. Elektra with the family she is hired to kill. And then, surprise, she finds out she is to kill them. I mean, so far these are the only people shown in the movie aside from Elektra’s aide back home, so there are really not that many options. She’s still ready to do it, but finally lets her sniper rifle aim down and decides to cancel the job from her part. Of course, there are more assassins coming and Elektra decides to put her own life in risk to protect this family, whom she barely knows and who to my understanding really don’t seem worth it, especially since she has no idea why they are wanted dead. Maybe they are the bad guys? At least the girl is a skilled thief. After lots of staring far off and looking broody, the family almost gets killed but are revealed to be natural born super ninjas with superpowers. Then, just when you thought the movie had come to its end, the story continues and something, and then we are revealed the person who hired Elektra to kill the family was in fact Stick (Daredevil’s and Elektra’s mentor), who had used this family to give Elektra a push to the right side… and apparently had also called for the Hand clan of ninjas to hire their best and deadliest assassins after this family. I suppose in the world of ninjas this is sound logic. Let’s begin with the most obvious, which is the script. It’s lacking a story arc. You know how it goes. You have the initial setup, then something happens which makes the lead character question his or her values and then comes to a solution when the main character has evolved somehow. The problem is, in the beginning of the movie Elektra is already questioning her life choices and thinking about quitting assassination jobs. The fact that she meets the family makes absolutely no difference because she already has gone through the change. The other thing is, the script assumes you are already familiar with everything. It assumes you already know Elektra’s backstory. Ok, well most of us do, but still it would have given some nice contrast to the situation she is in right now. Now it seems she is just either bored or depressed when she gets that far off stare, instead of weighing her values – though maybe she is just bored. Also the Hand seems to be just some weird conceptual thing where these ninjas appear from, and that’s it. Ok, so I suppose you don’t need much background story if you are just hired to kill someone, but it would have been nice if they had gone through the basics as who the hell are these people and why the hell do they have superpowers. Since I’m still stuck in the 90s with my Marvel knowledge it would have been nice to get something to work with. Now, for example, Typhoid was just some chick whose only power is to kiss Elektra in slo-mo. 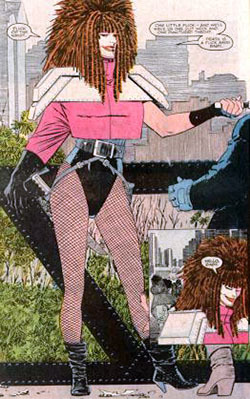 It also seems Typhoid is not the same Typhoid Mary from my youth but some other, new person with a new set of skills. And then there are the contant questions: What’s her motivation?! Who are these people? Why do they want to kill this family? Why is that girl suddenly with superpowers? Do I care? Minor thanks go to Jennifer Garner. She really tried her best given the circumstances, but what can a girl do when life deals you a pile of this. Also her Elektra costume was totally off. I suppose they had tried to make it more believable, but it was quite unflattering on Jennifer and not even practical for an assassin. So thumbs down for the costume department, too. Jennifer Garner was correct. Do not go to see this one. It’s a sad thing to watch an action movie where you get so bored you find yourself thinking about an essay due next month rather than concentrate on the movie. Also I just realised I have no idea how the movie ended. I’m sure I watched it all the way to the end, but my brain must have switched on powersaving mode.